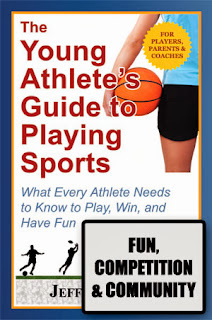 Here's an excerpt from chapter 9 (Fun, Competition, and Community) of my new book, The Young Athlete's Guide to Playing Sports. This chapter's lead topic discusses the reasons why we play sports, and how you can enjoy the benefits of participation throughout your life. Your personal journey in sports will wind its way through ups and downs, exhilaration and frustration, and success and failure. You will enjoy moments of elation when you brush perfection. Heartache will sometimes fill your soul when the prize remains out of reach. You will enjoy the camaraderie of playing sports with others, and sometimes face rejection. Sports, especially in competitive settings, are oppositional in nature. They pit you against an opponent—whether it’s a person, a standard of excellence, or your own expectations. This competitive quality can drive our participation. But besides the thrill of competing, there are a variety of other reasons (positive and negative) why we play sports. Central to a positive experience in sports are a set of fundamental elements. These include fun, skill development, heroic moments, increased self-esteem and self-reliance, community, and winning. Understand that the feeling of “fun” comes in different forms—from the simple joy of running around to more complex variations that embody team play and competition. Depending on your unique personality, choose the sports and competitive level that creates the type of fun you find most rewarding! Besides the immediate gratification of engaging in an enjoyable activity, fun is also an essential ingredient for long term participation. Although you may have talent and compete well, the absence of fun will likely lead you to quit when other external rewards (praise, recognition, etc.) are no longer present. Learning and mastering new skills is essential for you to have the necessary tools to participate, contribute, and compete. Although running around and casually playing a sport with your friends may be fun, more rewards and opportunity to play exist when you have mastered fundamental sport skills. One such reward is the self-confidence that is gained from an understanding of how to play a game and do it well. Sports are attractive partly because of the various feelings they evoke. Besides fun, there is also the “thrill of victory” and the “agony of defeat.” Heroic moments and glorious defeats are an essential part of the sports experience. They come together as a package deal—you can’t have one without the other. They impart upon you the potentially lifelong satisfaction of rising up to meet a challenge, and sometimes the heartfelt disappointment of a failed opportunity. Either way, these emotions add depth to your life experience. As you learn new skills, gain experience, and progress toward a clearer understanding of how to play a sport, your confidence will naturally grow. This, in turn, leads to an increased sense of self-esteem (satisfaction in oneself). You become more self-reliant, understanding that you individually command tools that can affect the outcome of a game. Your self-reliance also increases as you begin to organize and manage your own pickup games (a skill not cultivated within the adult-run games typical of youth leagues). When you play a sport, you share with other participants the game and its values. This is most evident in team sports, where success is dependent upon the contributions of each team member. But individual sports also provide a sense of community. Shared values are present in all sports. Community is also present in the bond that ties together athletes of all ages and generations. You and other young athletes feel the same joy and appreciation for sports that your parents, grandparents, and coaches experienced when they were young. You can also play certain sports (golf, tennis, etc.) with family and friends throughout your life. Vince Lombardi, a hall of fame NFL coach, once said, “Winning isn’t everything. It’s the only thing.” Although this may be true at the most competitive level of sports, it’s not true in youth and scholastic sports. But there are different ways to define “winning”—especially when you’re younger. Consider again the benefits described above. Those glorious defeats, where an individual or team competes courageously against a vastly superior team, do mean something. Improving one’s individual performance, regardless of others’ performance, is a “win.” Learning how to master new skills and successfully interact with others rewards you with the valuable prizes of self-reliance and confidence. And when it comes to winning the battle of lifelong participation and fitness, these other types of victories are often the ones that matter. I love the idea of a "glorious defeat." When two evenly matched teams go head to head someone has to lose. But if you gave it everything you had you can walk away with your head held high. Learning how to lose with grace and sportsmanship is a huge lesson to be learned!